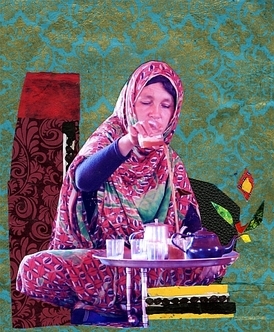 (Dallas, Texas) Join artist Robin Kahn for traditional Sahrawi tea in her MAP 2013 project, The Art of Sahrawi Hospitality at Main Street Garden, produced in partnership with Ro2 Art and Downtown Dallas, Inc. For this interactive MAP 2013 project, Kahn and six Sahrawi women are raising a large traditional Sahrawi tent (or “haima”) that will be open daily, 12 – 6 PM, in Main Street Garden, Oct 16 – 20. A companion exhibit will be on view at Ro2 Art Downtown, located at 110 North Akard, where Kahn's book The Art of Sahwari Cooking is also available for purchase. The Art of Sahrawi Hospitality is the continuation of Kahn’s project, Dining in Refugee Camps: The Art of Sahrawi Cooking, which began in 2009 when Kahn was invited to be an artist in residence at the Tindouf Refugee Camps where the people of Western Sahara have lived in exile since 1975. The residency inspired Kahn to create a cookbook that focused on how Sahrawi women have used the ritual of the meal to create a sense of home within a state of homelessness. In 2012, Kahn presented The Art of Sahrawi Cooking at dOCUMENTA(13), inviting the public to share a bowl of couscous and a conversation with women from Western Sahara about their lives. Robin Kahn (1961) lives and works in New York. She has exhibited and lectured about her work internationally, including The Art of Sahrawi Cooking at dOCUMENTA(13) in Kassel Germany and a series of programs at Museum of Modern Art in New York. Her work has been featured in numerous media outlets including New York Times, World Art, artnet.com and Creative Time Reports.